On friday 11 february I played a set at Bosch Acousmatic. Apart from the usual tape stuff, I ran my set through a pd patch on my netbook. This went very well. The evening was opened by The Acoustic Electric Chamber Orchestra. TAECO are Steven Vinkenoog and Frank Baijer who play guitars, balalaikas and toy microphones. The room and silence play a large part in their music. The set they played last friday was truly mesmerizing. My set included more synthetic tones. I started with a drone which returned later in my set. I also used unprocessed field recordings to contrast the processed noisiness. 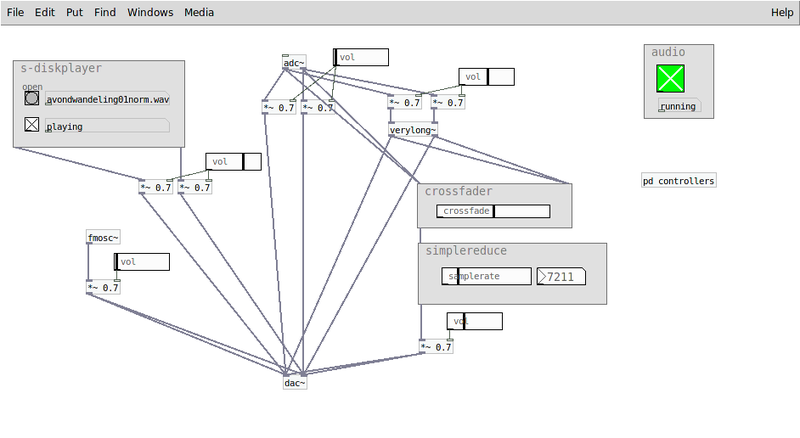 My usual rollercoaster of feedback loops was completed with a Pure Data patch. 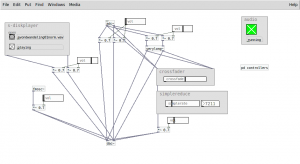 Pure Data, Pd for short, is Max/MSP’s half sibling and is an impressive piece of Free software. My patch isn’t very impressive but worked very well and the bits and pieces it was built from are available for download here.